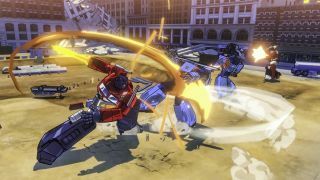 I never watched Transformers and don't really play fighting games, but I really wanna play Transformers: Devastation. Especially after watching the above trailer, which doesn't skimp on gameplay footage. As many others have noted, Devastation looks like a Saturday morning cartoon come to life, and that's an art style I can get behind. The footage above is a Sony trailer, and therefore (presumably) shows the game running on a PS4. Still, the game is definitely confirmed for PC, and with Platinum Games at the helm it might be a rare instance of a decent Transformers game.